Lockheed L-1249 Super Constellation là một phiên bản trang bị động cơ turbine của dòng máy bay Lockheed Constellation. 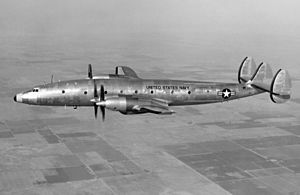 Lockheed Constellation Survivors - A website that explains information and whereabouts of surviving Constellations of all variants. The fates of the four L-1249 aircraft are mentioned in the Q&A section of the website. 1000 Aircraft Photos - Lockheed 1249A-94-75 YC-121F Constellation - A photograph of the second YC-121F delivered to the U.S. Air Force. Below the image is a small detailed summary on the L-1249A. Zoggavia - Lockheed 1951-1960 - A link which includes photographs and brief summaries of Lockheed aircraft from 1951 to 1960, including the YC-121F and R7V-2.